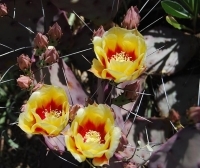 The Tucson Botanical Gardens is a major attraction, and not just for the rich collection of cacti and desert wildflowers. An educational walk highlights the history of the native Tohono O'odham Indians and the work local scientists have done to preserve native seeds. Be sure to visit the traditional Mexican-American neighbourhood garden (Nuestro Jardin), and relax on the shaded restaurant patio. The gardens are open seven days a week, all year, and provide a pleasant sample of the desert vegetation of Arizona as well as a taste of the indigenous culture. There are about 17 speciality gardens, as well as rotating exhibitions, and tours of the gardens are available.